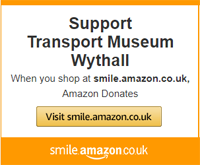 Many museums have 'Friends' organisations, becoming a member is the equivalent here at Wythall. We've one of the finest collections of buses and battery-electrics in the UK. The museum has been built up from nothing and is still run entirely by enthusiastic volunteers. By becoming a member you too can enjoy our vehicle collections at a closer level and get the satisfaction of making a valuable contribution to their future. be kept up to date with developments at the museum through our newsletter, 'Omnibus'. This is published bi-monthly and gives news, upcoming events, progress reports and articles both about our vehicles and the bus industry. have opportunities to go to rallies riding on buses from the collection. get reduced price admission on event days on production of your membership card. attend the Trust's Annual General Meeting where the Trustees report on their activities and members have the opportunity to give their input. be financially supporting Trust projects. And, if you want to become more actively involved, you can use your skills and learn some new ones, working individually or within a group. restoration and maintenance of vehicles, including engineering, coachbuilding and electrical work. staffing events and private hires. keeping the vehicles, the grounds and the buildings clean and presentable. research and cataloguing of the archive material and memorabilia. organisation of publicity and fund raising. development of the museum's educational programme and guiding visiting parties.